Record Company – Future Sound, Inc. Published By – Reo Publishing Co.
Nice electro, rap, gogo 12 inch with a cool rap version on it. Funny thing about this record is that the music andbeats are exactly the same as the Alvin - DT record (on the same Future records label). Only the rap is different on both records, very collectable records. This gogo and rap style are very known as the style Kurtis Blow used in his records. 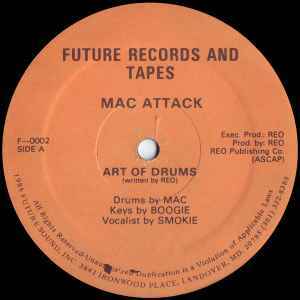 So if you like Kurtis Blow, you will probably like Alvin - DT and Mac Attack - Art of Drums! Although Mac Attack - Art of Drums isn't seen that much on Ebay, Alvin - DT is seen a couple of times on Ebay.